It’s no secret that consumers are spending an increasing amount of time with their smartphones. 50 percent of global mobile web users now use smartphones as either their primary or exclusive means of going online. For advertisers, the question isn’t whether or not to use mobile. It’s how to choose the appropriate marketing channel when so many are competing for a consumer’s attention. The answer might be found in Facebook’s new mobile ad network. Facebook recently rolled out a new mobile ad platform called Audience Network. This new tool allows advertisers to leverage Facebook’s targeting capabilities to place relevant ads within mobile apps. Facebook ads are typically effective because they deliver relevant content to already engaged audiences. Moreover, Facebook ads are measurable, allowing advertisers to track the effectiveness of ad campaigns. The new Audience Network allows advertisers these same benefits for ads that are placed within popular mobile apps. So why is this a big deal? Users spend, on average, 82% of their mobile minutes with apps and just 18% with web browsers. This suggests that ads within apps are more likely to be seen than typical web-based ads. Ads within apps are also highly effective. In a 2013 InMobi study, 54 percent of respondents noticed ads while engaged in an app. What Facebook now brings to the table is a way for advertisers to target these mobile users based on information such as demographics, interests and behavioral data. And Facebook has no shortage of data! Facebook potentially has an even greater database of accurate information about users than Google or Apple. 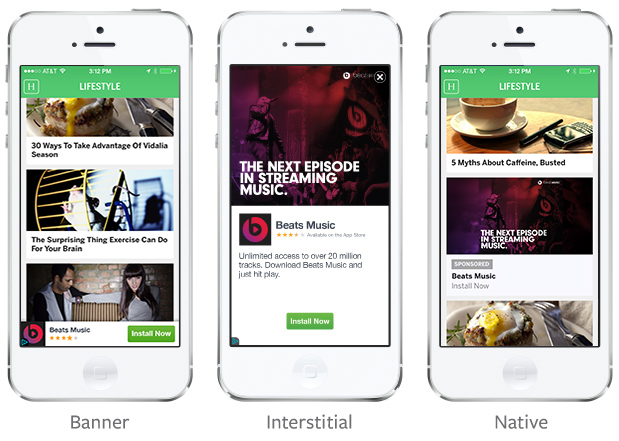 The Audience Network delivers ads in three formats: banner, interstitial and native. This gives app developers and advertisers flexibility. Tools like the Facebook Audience Network will also drive mobile ad spending. Mobile now accounts for 10% of time spent with media, but just 1% of total ad spending. Tools like Audience Network will likely lead to a distribution of ad dollars that is more in line with consumer consumption patterns. In fact, mobile ad budgets in the U.S. are expected to increase from $2.3 billion in 2012 to almost $11 billion in 2016. Targeted in-app advertising can provide consumers with a more relevant, less-intrusive experience. It can also allow brands to effectively reach and engage target audiences. The end result will be a more consumer-centric brand experience. Of course, not everyone will be comfortable with advertisers gaining access to personal data. How do you feel about Facebook using your information to provide more personalized in-app ads?